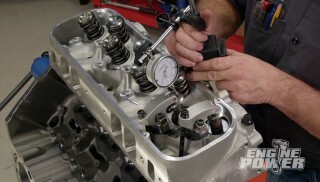 The students at SAM TECH build a supercharged Coyote engine to compete at the drag strip. (PAT)>> WELCOME TO ENGINE POWER. TODAY MIKE AND I ARE OUT OF THE SHOP AND HAVE TRAVELED TO A FAMILIAR PLACE. WE ARE AT SAM TECH IN HOUSTON, TEXAS. NOW I SPENT A LARGE PART OF MY CAREER HERE, FROM 1998 TO 2006 AS A RACE CAR DRIVER, INSTRUCTOR, AND GENERAL MANAGER, TEACHING STUDENTS HOW TO BUILD RACING ENGINES AND TODAY WE'RE HERE FOR MORE CUTTING EDGE TECH. THIS TIME ON FORD'S COYOTE PLATFORM. (MIKE)>> THE SCHOOL OF AUTOMOTIVE MACHINISTS WAS FOUNDED IN 1985. FOR NINE YEARS PRIOR TO THAT THE MASSINGILL FAMILY OPERATED A MACHINE SHOP. HOWEVER FINDING AND KEEPING QUALIFIED MACHINISTS WAS A CHALLENGE. (KIM)>> SO MY MOM CAME UP WITH THE IDEA AND SAID IT'S LIKE YOU'RE A TEACHER. WE'RE A SCHOOL AND WE TRAIN THESE PEOPLE AND THEN THEY LEAVE US AND GO START THEIR OWN BUSINESS, OR GO WORK FOR ANOTHER COMPANY OR A RACE TEAM. AND SO THAT'S HOW IT STARTED. (MIKE)>> AND SO THE MACHINE SHOP TRANSFORMED FROM A PLACE OF BUSINESS TO A PLACE OF LEARNING. THE CURRICULUM FOCUSED ON ALL ASPECTS OF ENGINE BUILDING, INCLUDING DESIGN, MACHINING, ASSEMBLY, AND TESTING. THESE SUBJECTS CONTINUE TO BE THE FOUNDATION, BUT OVER TIME NEW COURSES OF STUDY, SUCH AS EFI CALIBRATION, CNC MACHINING, AND SOON MOTOR SPORTS WELDING HAVE AUGMENTED THE ORIGINAL CURRICULUM. REFLECTING THE NEW COURSE OFFERINGS, IN 2016 THE SCHOOL'S NAME WAS CHANGED TO SCHOOL OF AUTOMOTIVE MACHINIST AND TECHNOLOGY. THEIR MISSION IS SIMPLE. 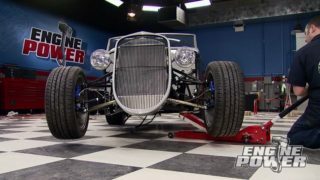 (JAMES)>> WE'RE GONNA TEACH YOU HOW TO MAKE HORSEPOWER. THERE'S A LOT OF TECH SCHOOLS THAT ARE GONNA TEACH YOU HOW TO CHANGE BRAKES, HOW TO DO ELECTRICAL WORK. WE DON'T DO ANY OF THAT. ALL WE DO IS STRICTLY HORSEPOWER. (PAT)>> AT THIS PLACE IT DOESN'T MATTER IF IT'S A COBRAJET PUSHING OVER 1,200 PONIES, A 408 INCH SINGLE TURBO LS, OR A 582 INCH BLOWN BIG BLOCK CHEVY, THEY KNOW HOW TO GET EACH AND EVERY BIT OF HORSEPOWER OUT OF IT. (MIKE)>> YOU'VE ASKED TO SEE MORE MODERN FORD PERFORMANCE AND WITH THIS COYOTE BUILD YOU'VE GOT IT. FOR SOME TIME NOW GM'S LS POWER PLANT HAS UNDERSTANDABLY GOTTEN ITS FAIR SHARE OF ATTENTION, BUT THE COYOTE IS GAINING A STRONG FOLLOWING. 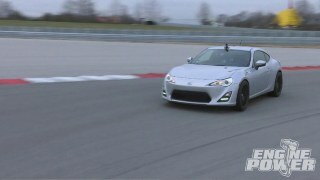 (JUDSON)>> THEY'RE NOW, A LOT OF MANUFACTURERS MAKING GOOD PARTS FOR IT. WE'RE FIGURING OUT THE BLOCKS AND SLEEVING MOST OF THEM. AWFUL GOOD ENGINE, I'M GONNA TELL YOU RIGHT NOW. WITH THE ADVENT OF THE COYOTE ITSELF OKAY? THE HEADS STARTED MOVING AIR, BLOCK'S GOT BETTER, PARTS GOT AVAILABLE, AND IT'S A PRETTY NICE DEAL. THERE'S NO DOUBT ABOUT IT. 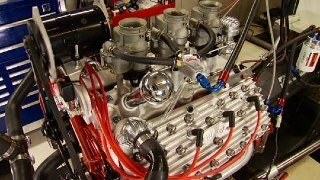 (PAT)>> THE FOUNDATION FOR THIS 303 CUBIC INCH COYOTE IS A STOCK FORD TRUCK BLOCK THAT HAS HAD CUSTOM SLEEVES INSTALLED HERE AT SAM TECH. THE ENGINE WILL RECEIVE CLEVITE RACE SERIES BEARINGS ALONG WITH A FORD CRANK SHAFT THAT CAN HANDLE WAY MORE POWER THAN YOU'D EXPECT FROM AN OEM PIECE. BRYAN PASTERNACK, THEY CALL HIM "SNACKS", KICKS THINGS OFF. AS PART OF A CREW OF STUDENT ENGINE BUILDERS, HE SAYS THERE ARE TWO CRUCIAL KEYS TO SUCCESS, TEAM WORK AND TRUST. (BRYAN)>> THE IMPORTANCE OF TEAM WORK IN HELP BUILDING ENGINES YOU HAVE TO HAVE A LOT OF TRUST IN THE PERSON THAT IS NEXT TO YOU. I LEARNED THAT WHEN I WAS IN FOOTBALL. ME AND MY LEFT GUARD, WE HAD A LOT OF TEAM WORK. WE'RE ALWAYS RIGHT NEXT TO EACH OTHER. SO WE HAVE TO KNOW HOW THE DEFENSE IS GOING AND WE'LL MAKE ADJUSTMENTS AT THAT TIME. IT'S THE SAME WAY HERE. YOU HAVE TO KNOW THE OTHER STUDENTS THAT YOU'RE WITH, THE OTHER PEOPLE THAT YOU'RE BUILDING ENGINES. YOU HAVE TO TRUST THEM TO KNOW THAT THEY TORQUED THAT BOLT DOWN RIGHT, THAT THEY DID THE RIGHT CLEARANCES, THAT THEY DID EVERYTHING CORRECTLY ALONG WITH YOU. IF WE DO SOMETHING WRONG IT COULD BE CATASTROPHIC. (PAT)>> ZACK NELSON, A SAM TECH INSTRUCTOR, GUIDES BRYAN ALONG THE WAY. ZACH ALWAYS ENJOYED BRACKET RACING WITH HIS FATHER, WHO MENTIONED THAT ENROLLING AT SAM TECH MIGHT BE A GOOD IDEA. (ZACH)>> HE WAS SEARCHING THE INTERNET ONE DAY AND COME ACROSS SAM TECH, AND SHOWED IT TO ME AND I WAS HOOKED FROM THERE. I THOUGHT I KNEW SOMETHING ABOUT THE RACING INDUSTRY WHEN I GOT HERE AND WITHIN ABOUT THREE WEEKS OF BEING HERE I KNEW THAT WASN'T TRUE, AND THERE WAS SO MUCH MORE TO LEARN AND TO ADVANCE ON. IT WAS A WHOLE OTHER INDUSTRY THAN WHAT I THOUGHT WAS REALLY OUT THERE. (MIKE)>> MAHLE MOTORSPORTS SUPPLIED A SET OF PURPOSE BUILT PISTONS FOR THIS BULLET. THEY'RE DESIGNED TO WITHSTAND THE HEAT AND PRESSURE OF HIGH HORSEPOWER APPLICATIONS. 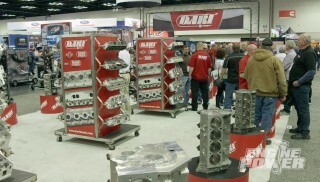 THE RODS COMPLIMENT THE ASSEMBLY NICELY AND ARE MADE BY MOLNAR TECHNOLOGIES. TROY MCBAIN, A STUDENT WHO CALLS HOUSTON HIS HOME TOWN, IS INSTALLING THEM BOTH. (TROY)>> SOMETHING ABOUT TAKING A BUNCH OF COMPONENTS AND GETTING THE TOLERANCES RIGHT. IT'S REALLY GRATIFYING TO SEE ALL THESE DIFFERENT COMPONENTS AND MAKE THEM INTO ONE WORKING PACKAGE. 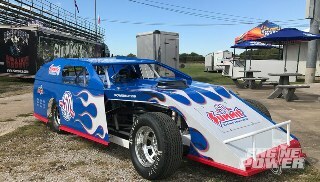 AND YOU GET THE GRATIFICATION AT THE END OF THE DAY SEEING IT RUN ON THE ENGINE DYNO, AND THEN PUTTING IT INTO THE CAR. AND THEN ULTIMATELY TAKING IT DOWN THE TRACK AND SEEING WHAT YOUR WORK HAS DONE FOR YOU. (MIKE)>> TROY HAS ALREADY INVESTED IN HIS CAREER. PRIOR TO STUDYING HERE HE RECEIVED HIS ASE CERTIFICATION. AT SAM TECH HE IS ATTENDING BOTH THE ENGINE BLOCK AND CYLINDER HEAD PROGRAMS. OFF ALL THE LESSONS HE'S LEARNED IN HIS STUDIES TROY CONSIDERS THIS ONE OF THE MOST IMPORTANT. (TROY)>> I'D SAY PROBABLY BEING PRECISE, THAT YOU'RE PROUD OF YOUR WORK AND THE QUALITY OF WORK YOU'RE PUTTING OUT. THERE'S JUST SO MUCH TO BE GAINED AND LOST BY NOT PAYING ATTENTION TO THE LITTLE THINGS. (PAT)>> WELCOME BACK TO ENGINE POWER. TODAY WE'RE IN HOUSTON, TEXAS, AT THE SCHOOL OF AUTOMOTIVE MACHINIST AND TECHNOLOGY. 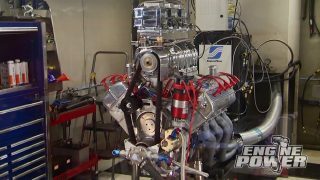 THE STUDENTS OF SAM TECH ARE BUILDING A BIG HORSEPOWER COYOTE ENGINE THAT WILL SOON FIND A HOME AS A POWER PLANT IN THEIR 1995 MUSTANG COBRA DRAG CAR. TO FIT THIS BULLET INTO THE FORD SOME MODIFICATIONS WERE NEEDED. (AARON)>> THE CAR'S BEEN SITTING FOR A WHILE. 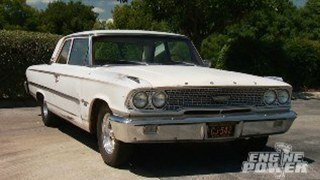 IN ITS LAST ITERATION IT HAD A SMALL BLOCK FORD IN IT. OF COURSE TO ACCOMMODATE THE MUCH LARGER COYOTE PLATFORM WE'VE HAD TO PUT IN A NEW CROSS MEMBER, A TUBULAR PIECE FROM UPR THAT THEY'VE CONTRIBUTED. THE OTHER MAJOR FACTOR WAS THE HEADER LAYOUT, AND OUR FRIENDS AT ARH PROVIDED SOME HEADERS AND ACTUALLY A BUNCH OF BENDS SO WE CAN CUSTOM FIT IT TO OUR CHASSIS AS NECESSARY. REAR END IS ACTUALLY THE EXACT SAME, JUST A SLIGHT GEAR CHANGE. WENT DOWN FROM THE FIVEZERO THAT WAS IN IT TO A 4.11 CURRENTLY. 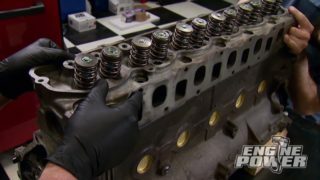 (PAT)>> THE COYOTE WILL RECEIVE STOCK FORD CYLINDER HEAD CASTINGS, AND LIKE MANY OF THE COMPONENTS ON THIS ENGINE THEY'VE BEEN MODIFIED IN HOUSE FOR MAXIMUM AIR FLOW. (SHAWN)>> GOT A REALLY GOOD VALVE JOB ESTABLISHED ON THEM. PLAYED WITH THE PORT QUITE A BIT. PICKED UP ABOUT 50 CFM. WENT IN AND CUT THE INTAKES AND EXHAUSTS. EVEN TUNED UP THE CHAMBERS A LITTLE BIT. IN STOCK FLOW NUMBERS WE WERE SEEING ABOUT A MAXIMUM OF ABOUT 300 CFM OUT OF THEM. WE GOT THEM UP TO ABOUT 350 CFM. REALLY NICE, PICKED UP A LOT OF MID RANGE FLOW THAT WE'LL SEE WILL REALLY BE HELPFUL FOR THESE TYPES OF APPLICATIONS. (MIKE)>> ASSISTING WITH THE INSTALLATION IS BRIAN ASKIN, A STUDENT FROM SHAWNEE, OKLAHOMA. AS BRIAN WORKS ZACK SHARES ESSENTIAL KNOWLEDGE TO DO THE JOB RIGHT. THINGS LIKE STUFFING PAPER TOWELS INTO THE PORTS SO FOREIGN OBJECTS CAN'T GET INTO THE ENGINE, AND ONLY LUBING THE TOP SIDE OF THE HEAD STUD'S WASHER, WHICH ENSURES THE CYLINDER HEAD IS NOT TORQUED DOWN TOO TIGHTLY. THAT'S REALLY IMPORTANT SINCE THIS ENGINE HAS A CONSIDERABLY HIGH TORQUE SPEC. (MIKE)>> AFTER SEVERAL MINUTES AND PLENTY OF NERVE WRECKING CREAKING NOISES THE HEADS ARE ON. (PAT)>> INSTRUCTOR AARON KUHN ALONG WITH STUDENT COLE BUCKNER HAVE STEPPED IN TO INSTALL THE CAMS, WHICH ARE A HYDRAULIC ROLLER DESIGN. HERE ARE THE SPECS. THE INTAKE CAME HAS A DURATION AT 50 THOUSANDTHS LIFT OF 236 DEGREES, AND THE GROSS VALVE LIFT IS 492 THOUSANDTHS. THE EXHAUST CAM HAS A DURATION AT 50 THOUSANDTHS LIFT OF 243 DEGREES, AND THE GROSS VALVE LIFT IS 453 THOUSANDTHS. THE CAPS ARE KEYED FOR PROPER ORIENTATION. THE CUT OUT ON EACH CAP NEEDS TO FACE DOWNWARD WHEN INSTALLED. (PAT)>> THE TIMING CHAIN AND TENSIONER ASSEMBLY IS A COOL PIECE OF ENGINEERING BUT THERE'S ALWAYS ROOM FOR IMPROVEMENT. (AARON)>> SO MMR ACTUALLY HAS THIS PLATE THAT WE'VE INSTALLED THAT FLIPS OUR TENSIONER OVER AND ACTUALLY PUTS IT ON THE SLACK SIDE AS OPPOSED TO OUR TIGHT SIDE. ALL RIGHT, WE'RE RIGHT IN WHERE WE WANT TO BE. (MIKE)>> ONCE THE CAMS ARE DEGREED THE LAST STEPS IN THE ENGINE ASSEMBLY ROOM ARE CARRIED OUT BY DEJEAN HULL AND COREY ROBERSON. 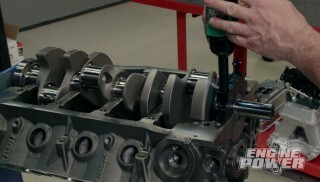 THEY BEGIN BY INSTALLING THE TIMING COVER. ONCE IT'S TORQUED TO SPEC THE ENGINE IS ROTATED AND THE FACTORY OIL PAN DROPS INTO POSITION. WHILE THEY WORK WE NOTICE THAT PAT HAS NOT FORGOTTEN HIS FORMER ROLL AS A TEACHER. 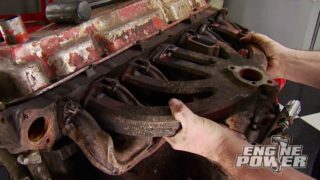 (COREY)>> NOW THAT WE'RE DONE TORQUEING THIS WE'RE GONNA FLIP IT OVER AND PUT THE VALVE COVERS ON IT, AND THEN WE'LL BE CLOSE TO PUTTING IT ON THE DYNO. (MIKE)>> ONCE THE VALVE COVERS, SPARK PLUGS, AND MSD IGNITION COILS ARE IN PLACE THE WORK IN THE ASSEMBLY ROOM IS FINISHED. (AARON)>> ALL RIGHT GUYS, WE'RE OUT OF PARTS ON THE TABLE. SO WE'VE GOT PRETTY MUCH A COMPLETE MOTOR. EVERYBODY CONFIDENT WITH WHAT WE DID? GOT IT? ALL RIGHT, WELL NOW'S THE MOMENT OF TRUTH. WE'LL GO GET HER ON THE DYNO CAR, SEE WHAT SHE DOES. (NARRATOR)>> UP NEXT, THE DYNO DOESN'T LIE! PLUS SAM TECH'S STATE OF THE ART CURRICULUM DESERVES A STATE OF THE ART BUILDING. 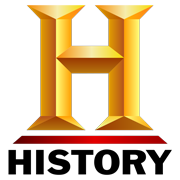 (MIKE)>> THE GROWTH OF NEW AND ADVANCED TECHNOLOGIES IN THE AUTOMOTIVE INDUSTRY CONTINUES WITHOUT END. SAM TECH STAYS ON THE LEADING EDGE OF THESE DEVELOPMENTS BY ADDING NEW PROGRAMS TO THEIR CURRICULUM, SUCH AS CNC MACHINING AND EFI CALIBRATION. CNC, OR COMPUTER NUMERICAL CONTROL, IS A TECHNOLOGY THAT USES COMPUTER FILES TO AUTOMATICALLY MACHINE MATERIAL. IT CAN CREATE COMPLEX THREE DIMENSIONAL SHAPES WITH GREAT ACCURACY AND REPEATABILITY. AT SAM TECH STUDENTS LEARN HOW TO PROGRAM CNC EQUIPMENT TO DO A WIDE VARIETY OF TASKS, FROM MACHINING LIFTER BORES TO MORE ADVANCED JOBS SUCH AS CYLINDER HEAD PORTING. THE DEMAND FOR CNC PROGRAMMERS IS STRONG, AND NOT JUST IN THE AUTOMOTIVE FIELD. (BRIAN)>> OUR CNC PROGRAM, WHILE IT HAS A FOCUS IN AUTOMOTIVE AND OUR WELDING WILL HAVE A FOCUS IN AUTOMOTIVE, IT'S NOT JUST FOR THE AUTOMOTIVE INDUSTRY. PEOPLE CAN COME TO US AND LEARN CNC MACHINING FOR THE OIL FIELD, AEROSPACE, MEDICAL FIELD, IT DOESN'T MATTER. 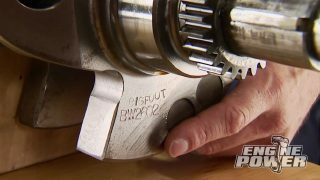 IF YOU'RE MACHINING A PART YOU'RE MACHINING A PART. 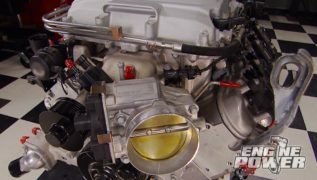 (MIKE)>> THERE'S NO DENYING THAT EFI REMAINS AT THE FOREFRONT OF NEW INNOVATIONS, AND SAM TECH OFFERS A COMPREHENSIVE PROGRAM IN EFI CALIBRATION. THIS ISN'T A WEEKEND TUNING SEMINAR. IT'S OVER 500 HOURS OF CLASSROOM AND LAB TIME, LEARNING THE MATH AND SCIENCE BEHIND ELECTRONIC FUEL INJECTION. WITH A DEEPER UNDERSTANDING OF HOW EFI WORKS A GRADUATE WILL BE ABLE TO MAKE CLEAR AND LOGICAL ADJUSTMENTS TO ANY EFI SYSTEM. (JASON)>> SOMEBODY CAN COME INTO SAM TECH, TAKE OUR SIX MONTH PROGRAM, AND REALLY AND TRULY UNDERSTAND ENGINE DYNAMICS AND AIR FLOW DYNAMICS, AND THEN BE ABLE TO TAKE A FILE AND BUILD IT FROM SCRATCH TAKING INTO ALL ACCOUNTS OF CYLINDER PRESSURE, ENGINE SIZE, VALVE EVENTS, CYLINDER HEAD FLOW, AND THEN LOOK AT THAT KNOW EXACTLY HOW, AND WHEN, AND WHERE THE ENGINE'S GONNA MAKE POWER. (MIKE)>> BUT ITS NOT JUST LECTURES AND LAPTOPS. THE LESSONS LEARNED IN THE CLASSROOM ARE PUT TO USE AT THE DRAG STRIP AND ON THE DYNOS. TODAY THESE STUDENTS ARE TESTING A '57 CHEVY BEL AIR RUNNING AN LS THREE POWER PLANT LOADED WITH AFTERMARKET COMPONENTS, AND OF COURSE THE ENGINE HAS BEEN MACHINED AND MODIFIED BY SAM TECH FOR MAXIMUM HORSEPOWER. IF YOU RECOGNIZE THIS INTAKE MANIFOLD IT'S LOWER HALF WAS ON THE ENGINE THAT POWERED LINDA MASSINGILL DOWN THE TEXAS MILE AT OVER 200 MILES AN HOUR. IT'S A CUSTOM DESIGN BUILT OUT OF A SINGLE PIECE OF BILLET RIGHT HERE AT SAM TECH. (PAT)>> THE EFI CALIBRATION AND CNC MACHINING DEPARTMENTS WILL SOON HAVE A MODERN NEW HOME. SAM TECH IS EXPANDING THEIR CAMPUS. PLANS HAVE BEEN DRAWN AND CONSTRUCTION WILL SOON BEGIN ON A BUILDING TO HOUSE THEM BOTH ALONG WITH A NEW WELDING PROGRAM. (BRIAN)>> I THINK ABOUT WHERE WE WERE IN TERMS OF THE FOOTPRINT THAT THE SCHOOL HAD BACK THEN TO WHAT WE ARE NOW AND WHAT WE'RE GOING TO BE. YOU KNOW WE KIND OF DOUBLED OUR SIZE FROM THE SCHOOL WHERE IT WAS AND NOW WE'RE GONNA DOUBLE IT AGAIN IN THE NEXT FEW YEARS TO ADD SOME MORE COURSES AND THINGS LIKE THAT. (PAT)>> THE COYOTE MADE 516 HORSEPOWER AND 408 POUND FEET OF TORQUE ON ITS BASELINE RUN. 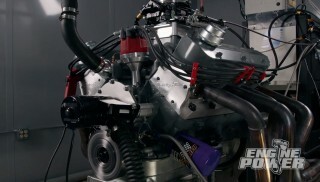 GREAT NUMBERS BUT THE CREW AT SAM TECH HAS SOME BIG PLANS IN STORE FOR THIS BULLET. (NARRATOR)>> AND THOSE PLANS INCLUDE A SUPERCHARGER! (PAT)>> THERE'S ONE THING WE ALWAYS NOTICE WHENEVER WE VISIT SAM TECH. EVERY STUDENT WE MEET IS HERE BECAUSE THEY LOVE WHAT THEY'RE DOING, AND LOVE LEARNING MORE ABOUT IT. A GREAT EXAMPLE IS TAYLOR OWENS FROM ORLANDO, FLORIDA. HER GOAL IS TO BECOME A MACHINIST ON A RACE CREW. MANY STUDENTS SPECIALIZE IN ONE OR TWO AREAS. TAYLOR PLANS TO STUDY FOUR, ENGINE BLOCK, CYLINDER HEAD, AND CNC MACHINING AS WELL AS EFI CALIBRATION. (TAYLOR)>> THAT'S THE PROBLEM, I LIKE ANYTHING WITH WHEELS. IT'S MY PASSION. (PAT)>> FOR TAYLOR THE INSTRUCTION FROM TEXT BOOKS IS MEANINGFUL BUT THE KNOWLEDGE GAINED FROM REAR WORLD EXPERIENCE HELPS HER TRULY UNDERSTAND ENGINE BUILDING. (TAYLOR)>> YOU CAN THINK YOU HAVE AN IDEA WHEN YOU READ THE CHAPTER OR WHEN YOU READ A PAGE, BUT YOU GO OUT THERE AND YOU DO IT. THAT'S A WHOLE DIFFERENT WORLD. YOU'RE MORE CONFIDENT YOU CAN DO THE WORK. (PAT)>> TAYLOR IS SOFT SPOKEN AND RESERVED, BUT SHE IS FEARLESS WHEN IT COMES TO LEARNING NEW EQUIPMENT. (TAYLOR)>> IF YOU STAND BACK YOU'RE NEVER GONNA GET THE MASTERY OVER THESE MACHINES. TO BE THE BEST YOU HAVE TO PUT IN THE TIME AND I WANT TO BE THE BEST. (PAT)>> SHE HAS A POWERFUL MESSAGE FOR ANYONE THAT WANTS TO TRY SOMETHING NEW BUT MIGHT HAVE THEIR DOUBTS. (TAYLOR)>> PROBABLY JUST TAKING THE FIRST STEP. THAT'S THE SCARIEST PART. WONDERING IF YOU CAN DO IT OR NOT. YOU CAN DO IT IF YOU JUST TAKE THE STEP INTO WHATEVER YOUR TRYING TO GO INTO. (AARON)>> THE FRONT COVERS, YOU SHOULD BE GOOD? (MIKE)>> THE SAM TECH CREW HAS ALREADY GOTTEN 516 HORSES FROM THEIR COYOTE ENGINE BUT THEY'RE HOPING TO DOUBLE THAT NUMBER WITH A VERY HIGH END POWER ADDER. 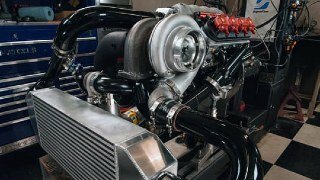 IT'S A PROCHARGER CENTRIFUGAL SUPERCHARGER, WHICH INTRODUCES LARGE VOLUMES OF COMPRESSED AIR INTO THE ENGINE, BURNING MORE FUEL, WHICH IS THE RECIPE FOR MORE POWER. AFTER IT'S INSTALLED AND JASON MAKES A FEW MINOR ADJUSTMENTS TO THE FUEL CURVE WE'RE READY FOR ANOTHER PULL. (ZACK)>> IT PICKED UP A BUNCH, WOW! HERE WE GO! IT PICKED UP FOUR AND A HALF. 806 FOOT POUNDS! THAT'S AWESOME! (PAT)>> I SAW IT GO OVER 800 WHEN IT LOADED UP AND I'M LIKE MAN, THAT'S GONNA MAKE A BIG NUMBER RIGHT HERE. ( )>> THAT IS EVIL RIGHT THERE! THAT IS PRETTY SWEET! (PAT)>> ALL RIGHT, LET'S KEEP GOING! (PAT)>> THAT PICKED UP A LITTLE. DUDE THAT'S AWESOME, 1,158. (PAT)>> IT FLATTENED RIGHT OUT. ( )>> THAT TO WORK ALMOST AT 7,500 RPM, THAT'S INCREDIBLE! 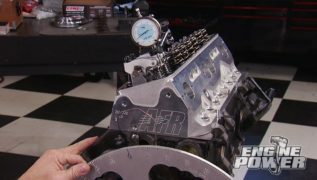 (MIKE)>> THE BIGGER HEADERS WERE GOOD FOR 14 MORE HORSEPOWER, OR 1,158 HORSEPOWER TOTAL. TORQUE REMAINED A STRONG 806 POUND FEET. (PAT)>> STARTING WITH AN EMPTY BLOCK THE STUDENTS AND INSTRUCTORS AT SAM TECH CREATED AN INSPIRING RACE READY POWER PLANT USING HIGH PERFORMANCE PARTS AS WELL AS THEIR MODIFICATIONS AND KNOW HOW. IT'S A TESTAMENT TO THEIR DEDICATION TO LEARNING AND TEACHING. (JUDSON)>> WHEN YOU GET SOME OF THESE KIDS AND YOU SEE THEM JUST, YOU KNOW, THE LIGHT COMES ON AND THEY GO WOW I CAN DO THIS AND I LOVE WHAT I'M DOING. THAT'S A NEAT A DEAL, THAT'S A NEAT DEAL! (PAT)>> THE FUTURE LOOKS BRIGHT FOR SAM TECH AND THEIR STUDENTS. LAST YEAR THE HOUSTON CHRONICLE CONDUCTED A STUDY OF HOUSTON AREA TRADE SCHOOLS. SAM TECH RANKED NUMBER ONE IN AVERAGE GRADUATE SALARY, INCLUDING FOUR YEAR UNIVERSITIES AND COLLEGES IN THE MIX, SAM TECH CAME IN AT NUMBER FIVE. THAT'S ESPECIALLY IMPRESSIVE WHEN YOU CONSIDER THAT A DEGREE FROM SAM TECH CAN BE EARNED IN 18 MONTHS, NOT FOUR YEARS OR MORE. 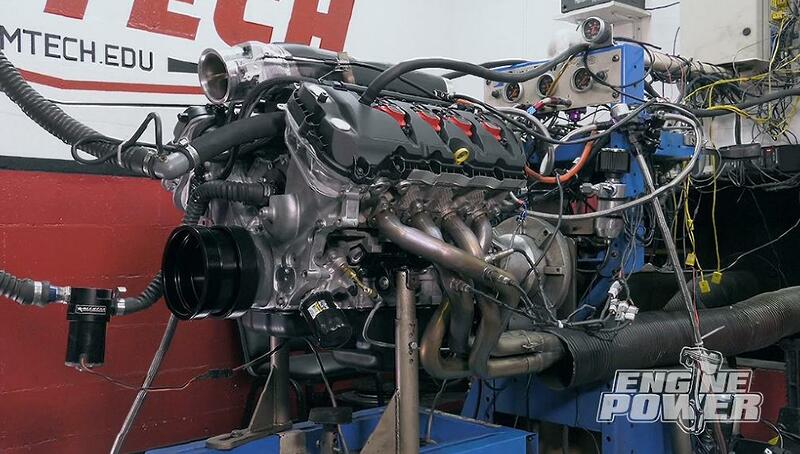 IF YOU LOVE HORSEPOWER AND WANT TO FURTHER YOUR CAREER SAM TECH MAY BE IN YOUR FUTURE. FOR MORE INFORMATION ON TODAY'S SHOW GO TO POWERNATION TV DOT COM.